Posts 1 through 7 for Grandson's first fish ever! 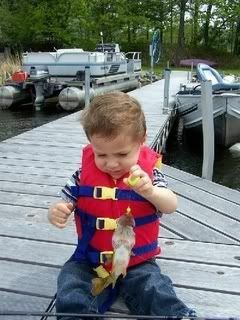 Grandson's first fish ever! - - - 7 messages. Showing 1 through 7. Jack is two years old. He caught this perch on a very windy Cass Lake on fishing opener. And then he went on to catch 5 more, so he must enjoy fishing! Camera batteries died after first photo. awsome..first of many i'm sure!! awesome pic thanks for sharing with us ! I added the photo to the pics page. Thanks! I bet he is Hooked for life! That is great! Thank you for making sure there are will be fisherman for generations to come!